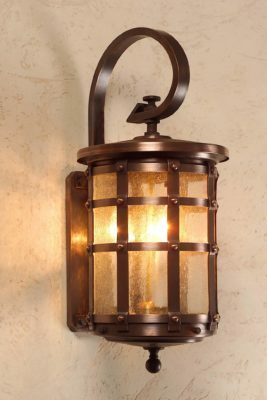 First & foremost Hammerworks handcrafted reproduction OWP1 Tudor Style Copper Post Lantern employs a construction method using heavy solid copper. As a result they fulfill your design expectations with some of the most unique Olde English Tudor Lighting available. Important features of this collection include riveting, which is the defining style, as well as hammer forging of the heavier metal pieces. Also the process of metal spinning the tops & bottoms, as well as the custom bent glass complete each piece. Most importantly we offer the English Tudor Copper Wall Lantern OWW1 and Tudor Style Copper Wall light OWW1A to coordinate. Furthermore English Tudor Hanging Light Fixture OWH1 and Tudor Style Ceiling Copper Light OWC1 complete this impressive collection. 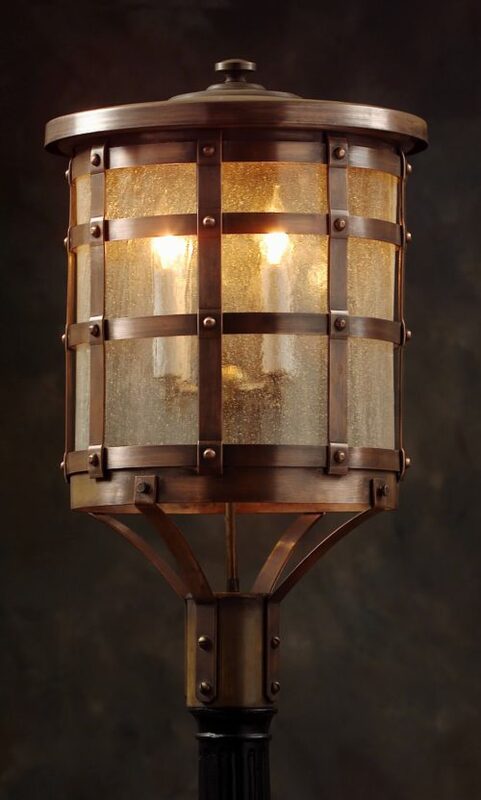 The Tudor Style Copper Chandelier CH421 offers a look unparalleled in the lighting industry. First of all the strong but simple shape of the chandelier stands out in any setting. Yet the hand applied rivets and hammered copper surface provides detail and texture demanding a closer look. Furthermore the graceful half round shape of the coordinating English Tudor Wall Sconce S143A and Tudor Wall Sconce S143 mirror the strong simple lines of the chandeliers. In addition the Arrowhead shaped Tudor Style Wall Sconces S144 offer a look that is uniquely “American”. Of course each sconce and chandelier is fully handcrafted from heavy gauge copper creating a look exclusive to Hammerworks. The designs add special charm & character to any room. Consequently they are especially suited to log homes, lodges and other rustic settings. For a decidedly more traditional collection, look no further than English Street Post Lantern 920P and its’ counterparts. Available in 2 post sizes as well as English Style Wall Light 920W the smaller 921W you will easily find a size and style to suit your needs. 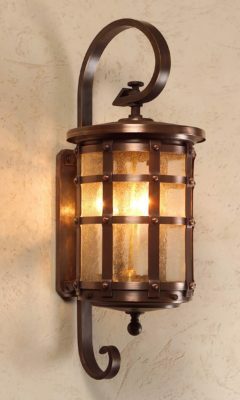 The Manor Collection including Old English Manor House Copper Post Lantern 922P, English Manor House Wall Lights 922W and English Manor Copper Hanging Lights 922H offers another exquisite choice.